Automate SPDT TR relay. 6v AC, 50/60 Hz. "N" females. Fashioned after the reliable DK-60. 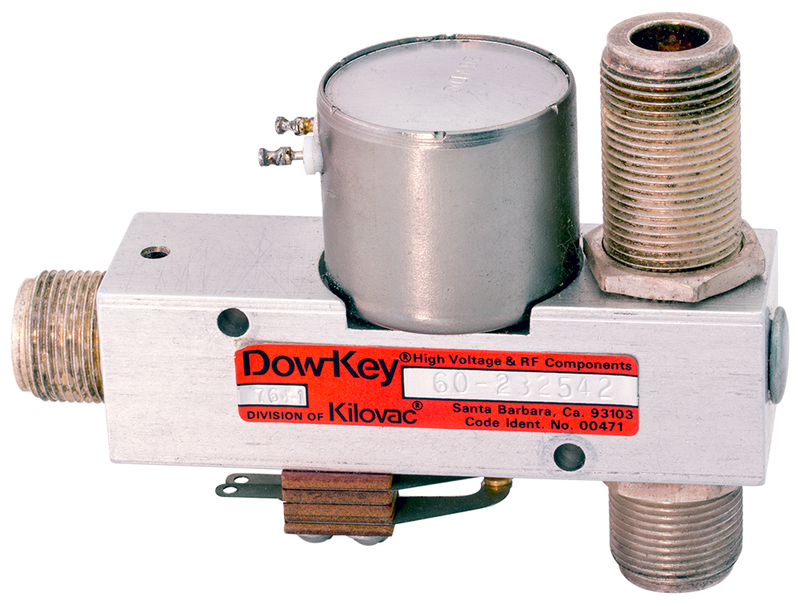 Dowkey SPDT pulse latching relay. 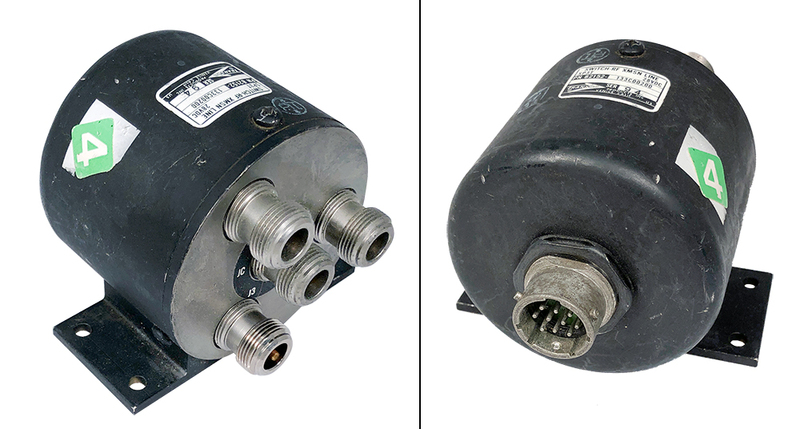 12v DC, DC-12.4 GHz, 50 ohms, "N" female connectors. Indicator contacts. New! 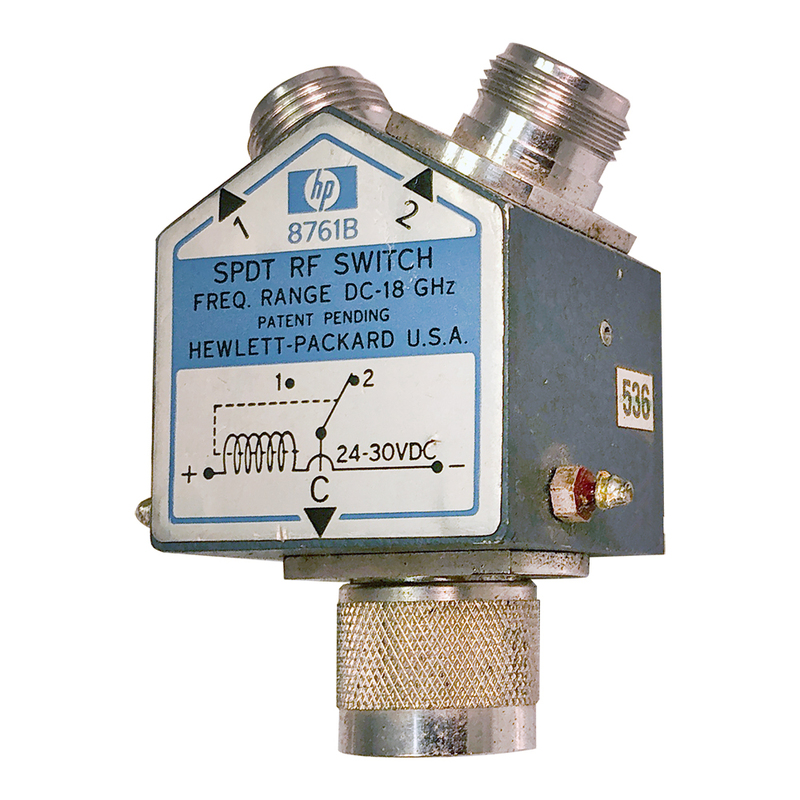 HP RF coaxial switch. 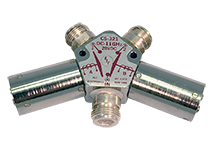 12 - 15v DC, DC-18 GHz, SPDT. "N" males on all ports. 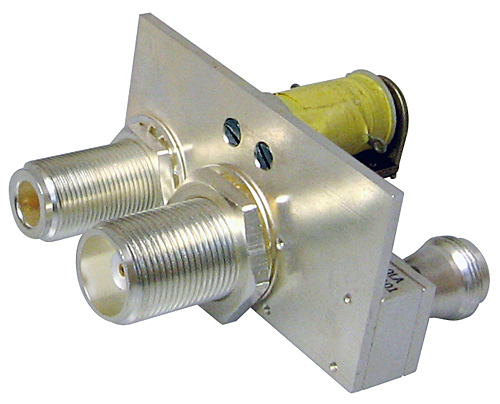 HP RF coaxial switch. 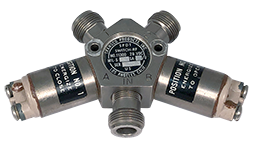 12 - 15v DC, DC-18 GHz, SPDT. "N" female outputs, "N" male input. 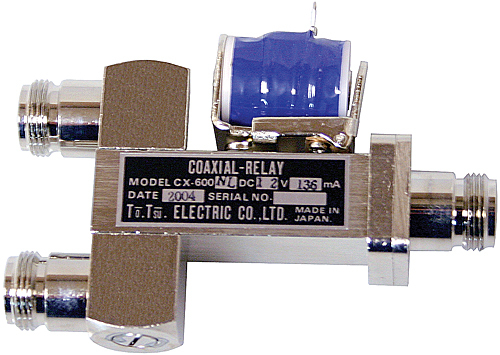 RLC "Y" relay. 28v DC, 11 GHz, "N" females. 2 independent coils. Transco SPDT "Y" relay. Independent 28v DC coils. "N" female connectors. DC-11 GHz. 500w @ 1 GHz (10kw peak). Same as CS321. Used. Transco SPDT "Y" relay. Independent 28v DC coils. "N" female connectors. 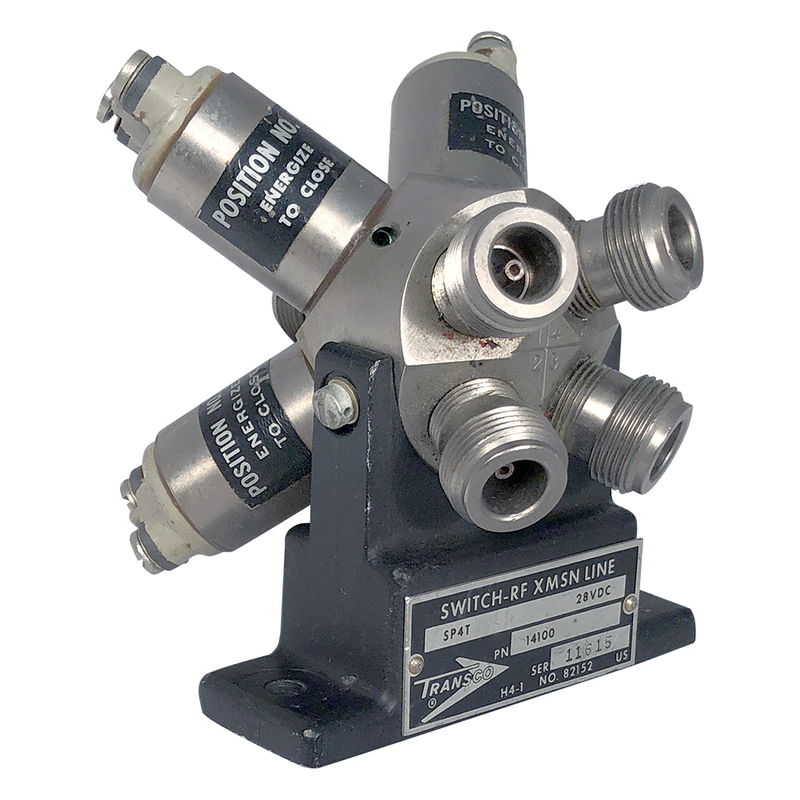 DC-11 GHz. 500w @ 1 GHz (10kw peak). Same as CS321. 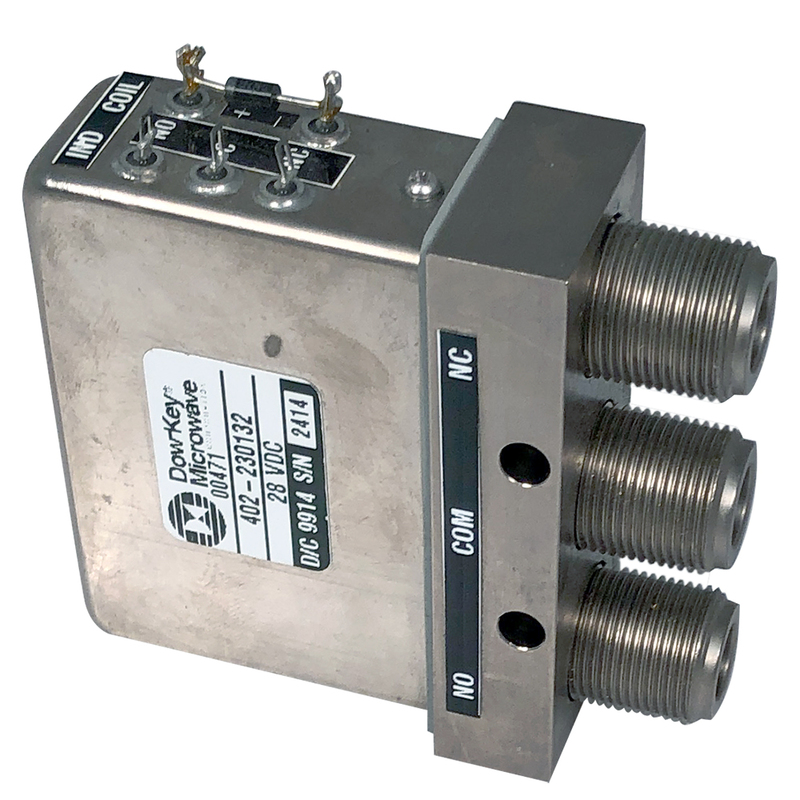 Dowkey 4-port transfer switch. SPDT indicating circuitry. 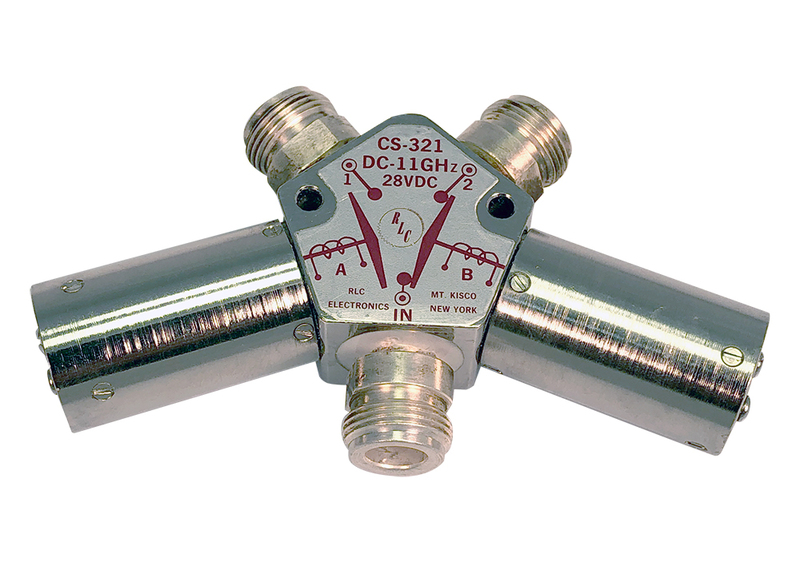 28v DC, DC-12.4 GHz. "N" female connectors. Removed from new equipment. Dowkey SPDT relay. 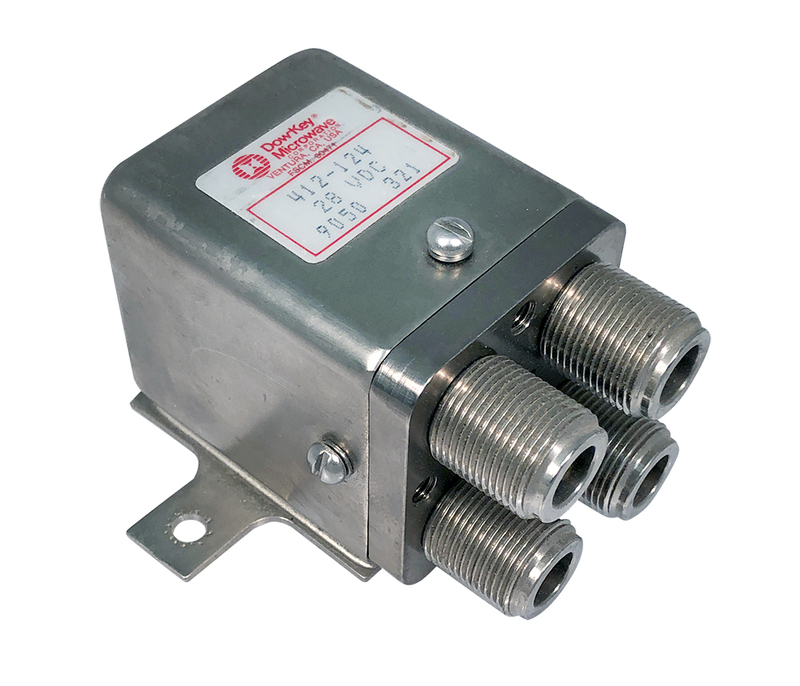 402 Series failsafe relay. 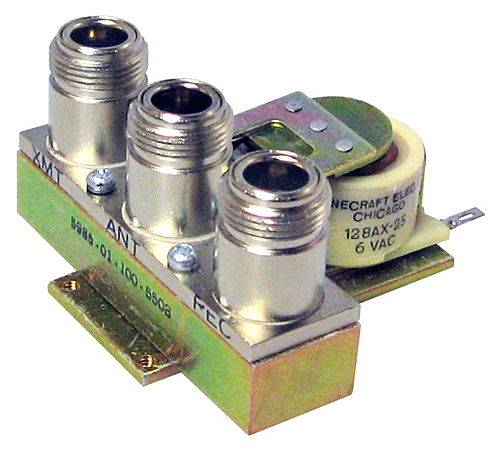 28v DC, DC-12.4 GHz, "N" female connectors. Indicator circuitry. Break before make. 3kw @ 100 MHz, 350w @ 12.4 GHz. Transco SP3T relay. 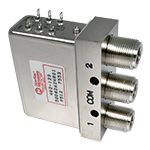 28v DC, 205 ohm coil, DC-12.4 GHz, 100dB isolation, 0.05dB isolation. "N" females & 10-pin connector. 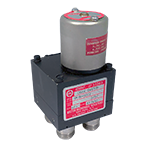 Individual solenoids - fast sequence time. Includes indicator circuitry. 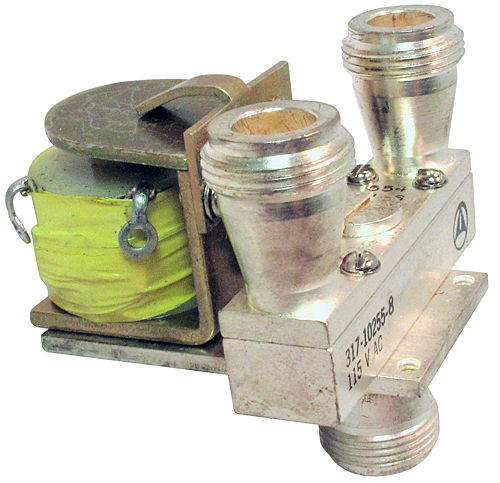 2-3/4"D x 2-3/4"H.
Transco SP4T relay. 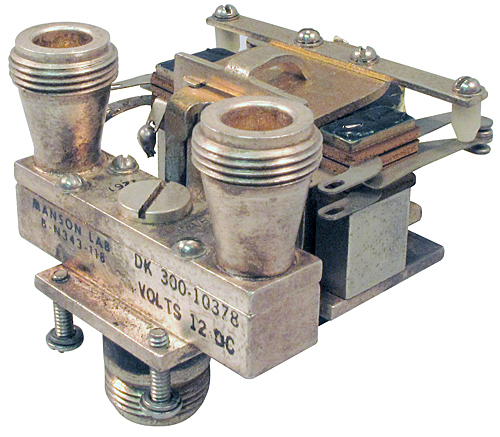 28v DC, independent coils, DC-12 GHz. Make before break contacts. 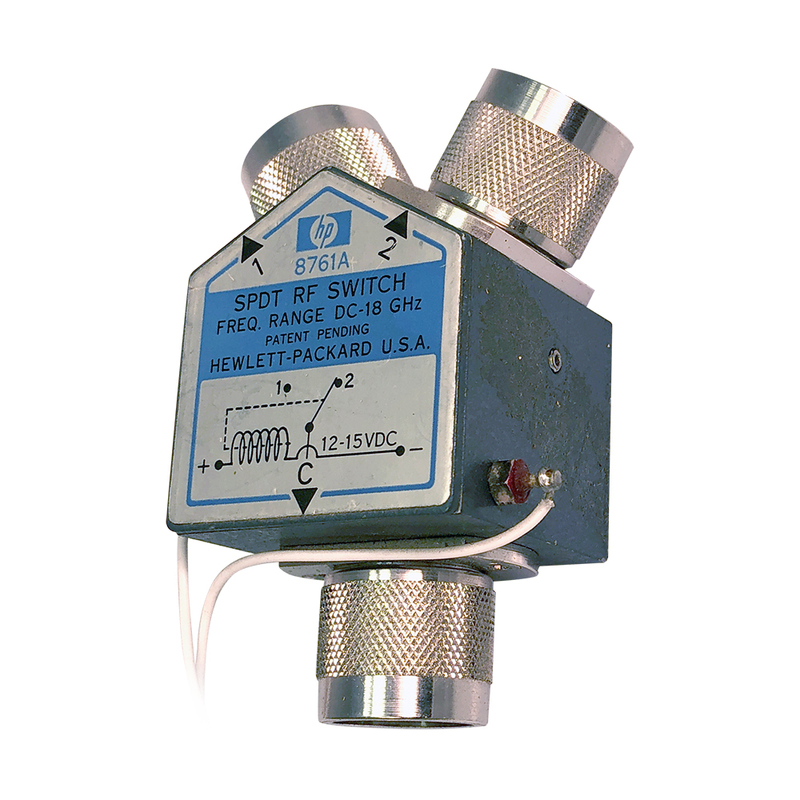 Sector Microwave Industries transfer switch. Type "N" connectors. 117v AC coil. 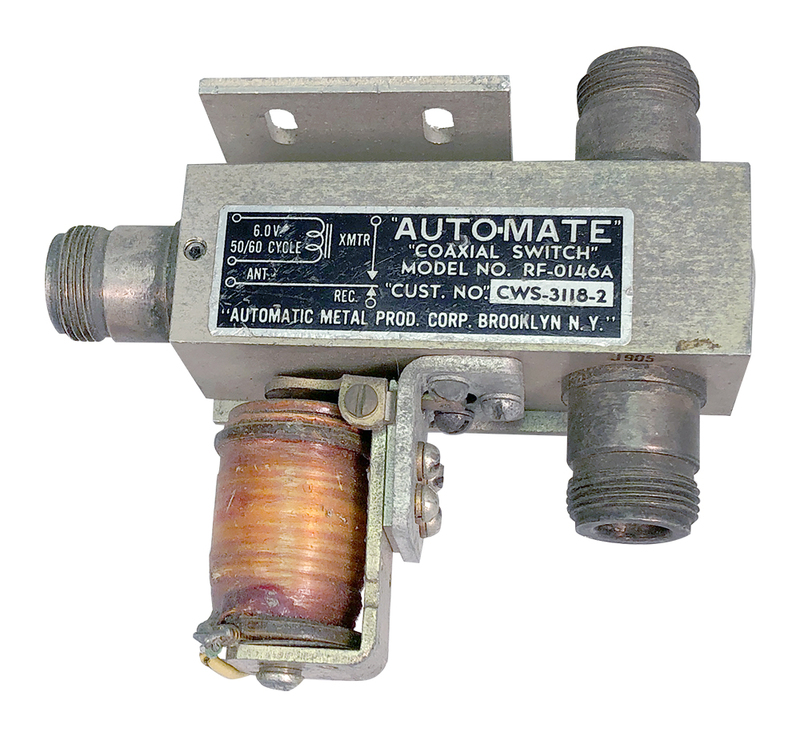 Turn coil on top to manually operate switch. Indicator circuit. 6-pin connector, MS3112E10-6P. 2" x 2" x 3-3/4"H.
Transco fail safe transfer switch. 0 - 12.4 GHz, 28 vdc. 60 dB isolation minimum @ 12.4 GHz, 90 dB @ 10 MHz. 1.5 : 1 max VSWR @ 12.5 GHz (1.2 : 1 typical). 100 watts - 12.4 GHz, 1,000 watts @ 1 MHz. Type "N" connectors, 50 ohm. Break-before-make contacts. 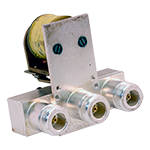 All transfer switches have 4 ports and all operate the same way. Label ports 1, 2, 3 & 4. It has two positions, A & B. Position A: Ports 1 & 2 are made, 3 & 4 are made. Position B: Ports 1 & 3 are made, ports 2 & 4 are made. 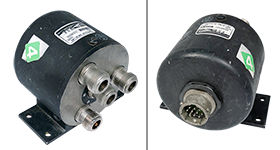 Requires 6 pin circular connector to mate with MS3113H10-6P which we can supply. 6 pin circular connector for Transco transfer switch (above). Amphenol RF relay. 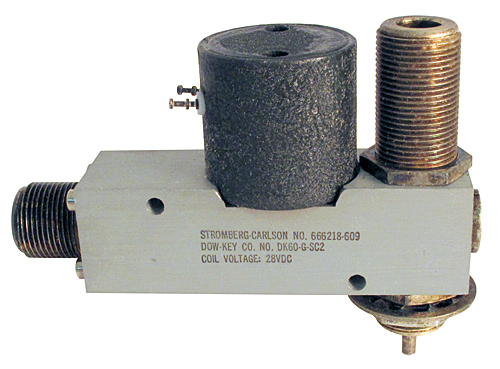 SPDT, 115 vdc coil. 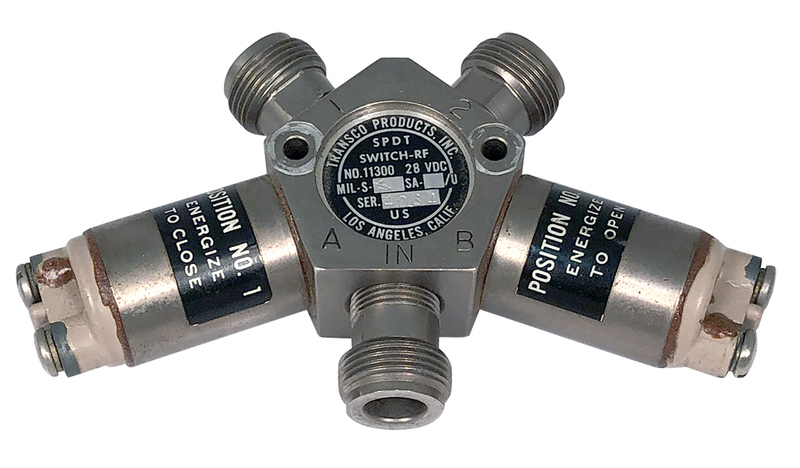 Common: 'N' connector; normally open: 'N' connector; normally closed: 'BNC' connector. 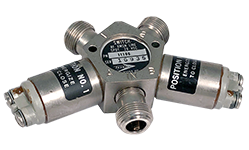 Great for KWS-1 antenna chargeover relay. Collins P/N: 410-0086-00. NSN: 5985-00-258-3205. Intended band was military VHF, 225-400 MHz but we have found its integrity is maintained to over 2 GHz. Handles 1000 watts plus. Make before break contact. 28 vdc coil. 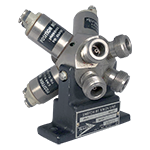 Made for military to spec "NA5-73674" by Quantatron, a Teledyne Company. New. 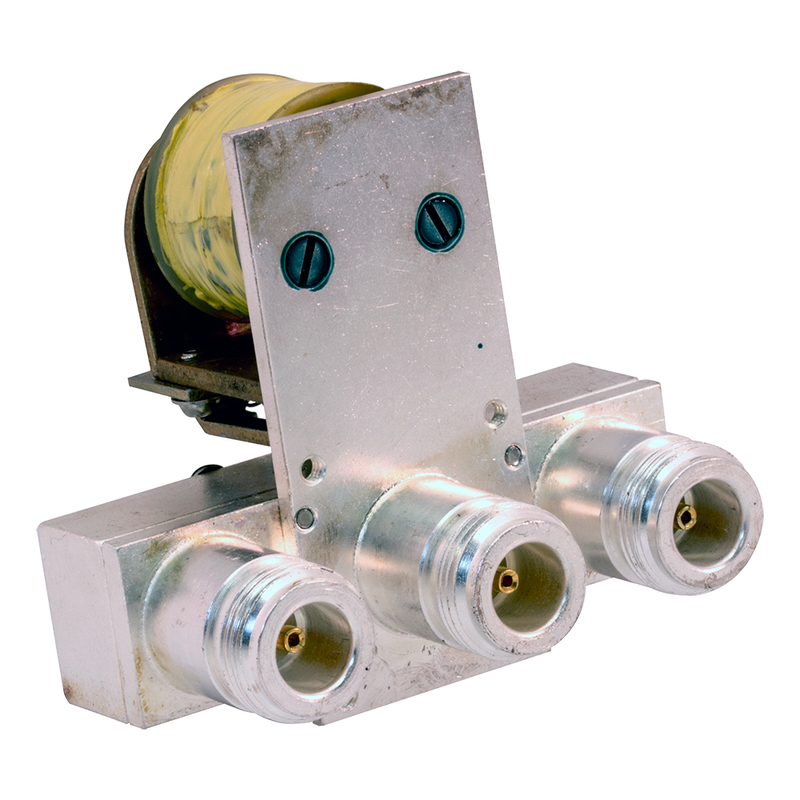 All transfer switches have 4 ports and all operate the same way. Label ports 1, 2, 3 & 4. It has two positions, A & B. Position A: Ports 1 & 2 are made, 3 & 4 are made. Position B: Ports 1 & 3 are made, ports 2 & 4 are made. Dowkey SPDT "N" relay. Two independent SPDT auxilliary contacts. 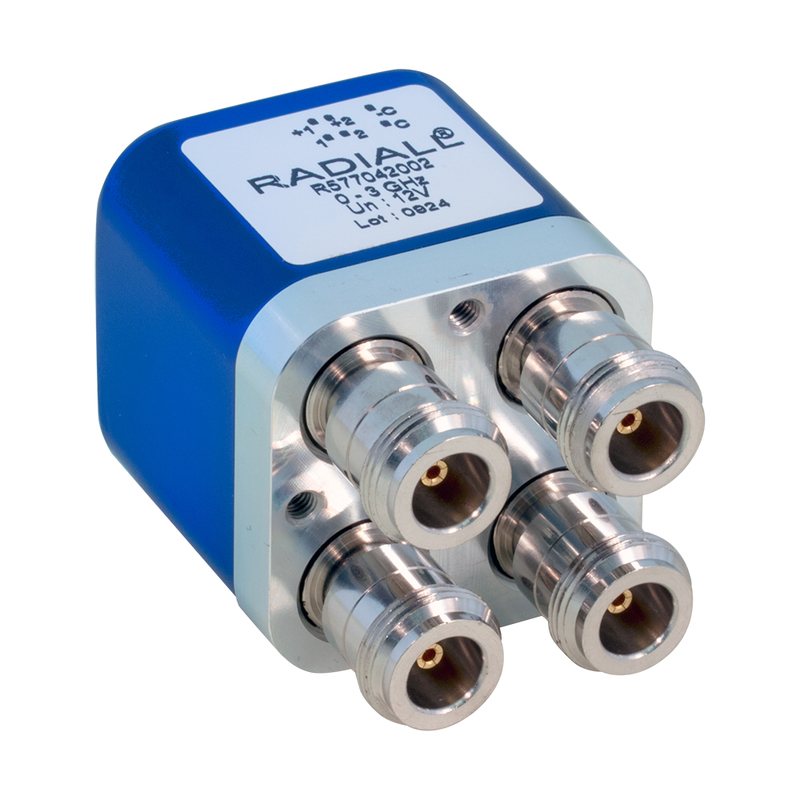 12 vdc coil, DC-2 GHz, 300w. Grounds unused port. Used, removed but in excellent condition. 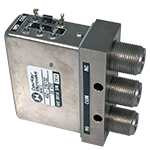 Joslyn / Amphenol RF transfer switch. 4 port. 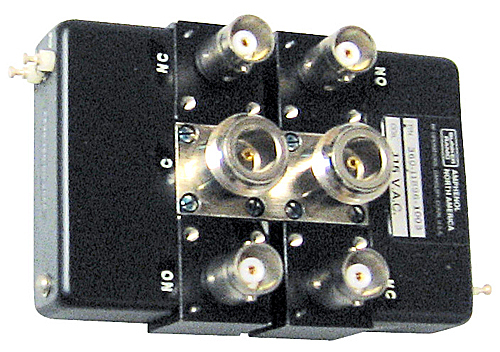 26 vdc. "N" female connectors. NSN: 5985-00-788-6927. 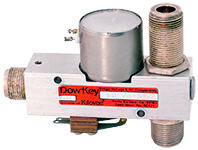 Dowkey popular DK-60 coaxial relay. 26v DC coil, SPDT. Includes DPDT auxillary contacts. 2000w, DC-30 MHz. "N" female connectors. Used, excellent condition. Source: Bogdan. Compact transfer switch. Type "N" connectors. 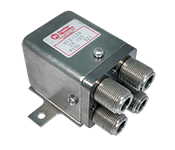 28 vdc control, handles up to 2 kw, up to 1 GHz. Surplus Sales may substitute Transco 16500. 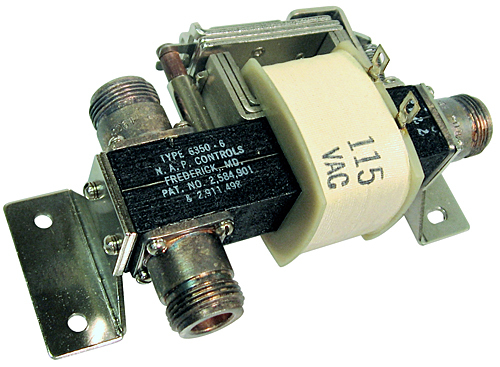 SPDT coaxial relay. Type "N" connectors. 115 vac coil. 2 kw pep / 1000w CW. Isolation 50 dB @ 30 MHz, 32 dB @ 400 MHz, 24 dB @ 1000 MHz. New, unused. The Transco Rotary Relay is latching. That is to say the motor drives the armature to the next position and disengages the voltage. Relay and connector new and unused. SPDT. "N" connectors. 28 vdc, 3 kw, 500 MHz. Apply power to pins "B" and "C" to connect common to #1. Use "B" and "D" for common to #2. Polarity of applied voltage does not matter. 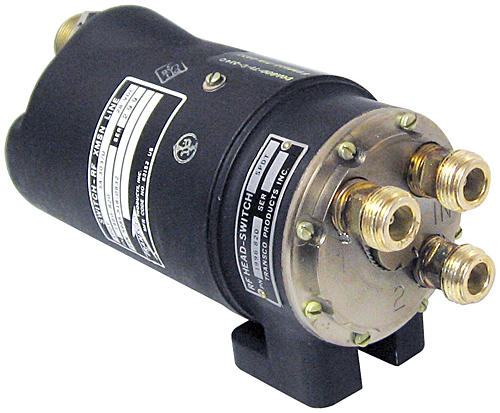 Amphenol coaxial relay. 115 vac coil, 100 watt, 3 GHz. "N" female. Breaks before makes. Grounds unused port. Transco SPDT, independent port control. Type "N" connectors. 28 vdc control. Handles up to 3kw. SPDT, Y relay as above. Type "N" connectors. Make before break. 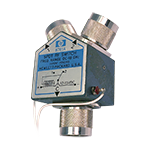 Amphenol RF coaxial relay. SPDT. Makes before breaks, Type "N" connectors. 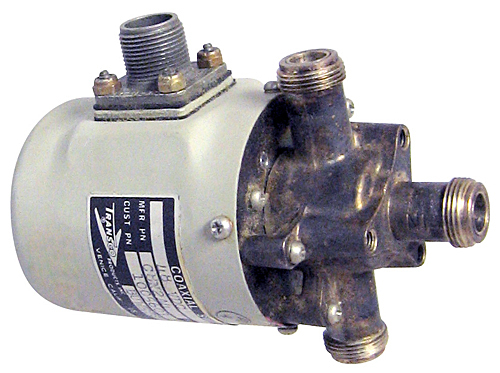 26 vdc. 100w @ 3 GHz. 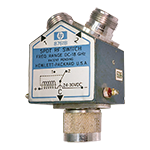 SPDT, 80 vdc. Type "N" connectors. Mil-spec, sealed. 50 ohm. 2500w, 500 MHz. 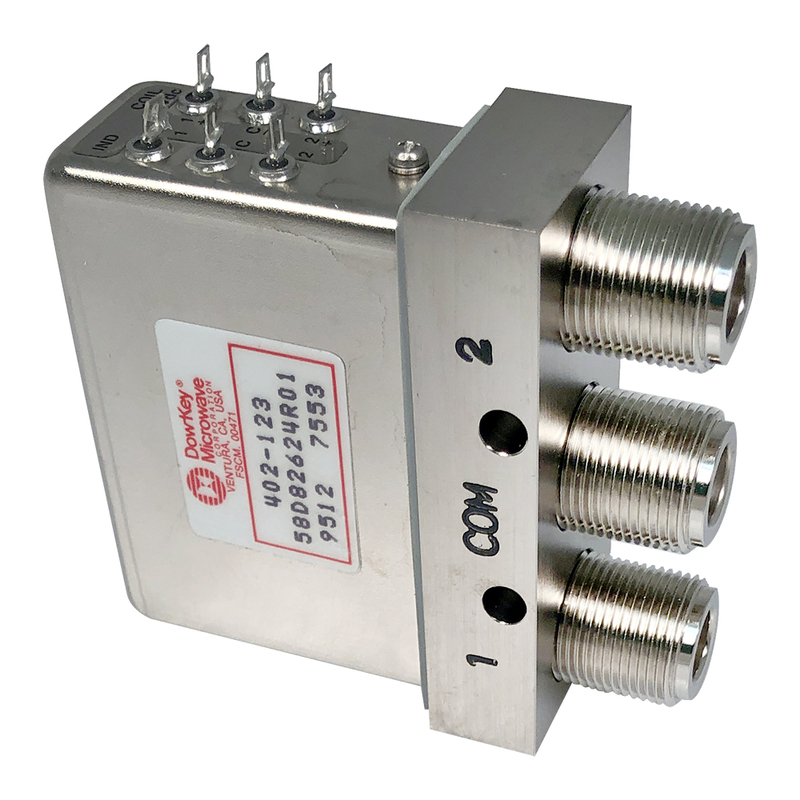 Amphenol RF coaxial relay. 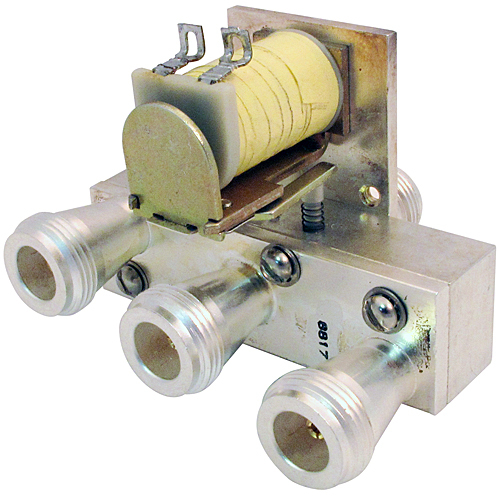 Two separate SPDT relays mounted side by side, DC-6 GHz, 200 watt. 115 vac control. "N" common and BNC connectors on the ports. 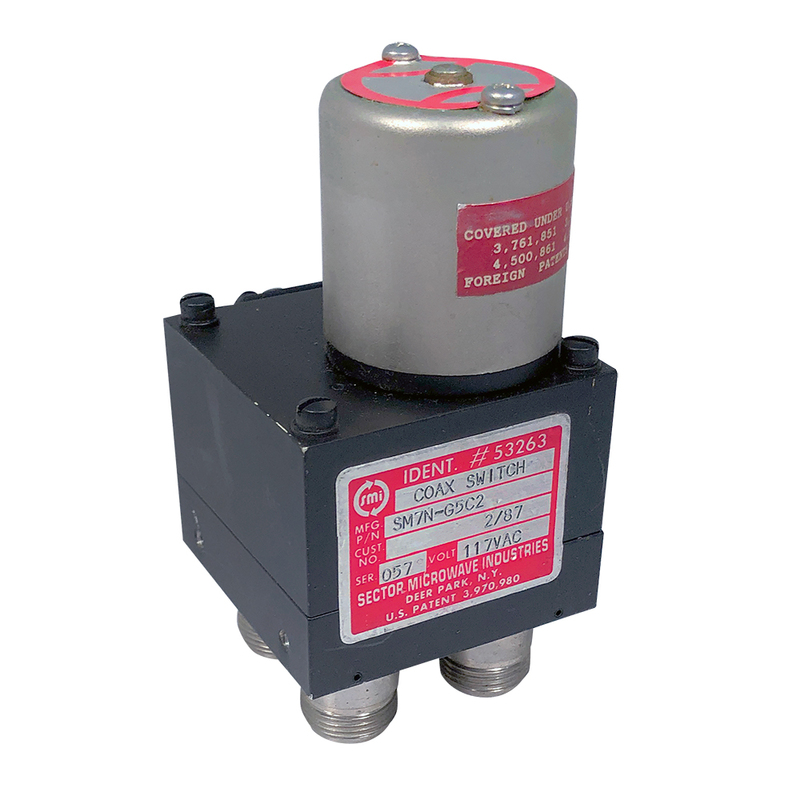 Rated DC-12 GHz this SP3T mil-spec relay has make before break contacts, Type "N" connectors and 120 vdc individual coils. 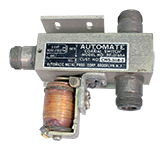 This commercial new, military surplus relay operates on 48 vdc, is usable to 500 MHz and handles 1000 watts. It has a 3 pin circular terminal connector (mating female pins $2 each). 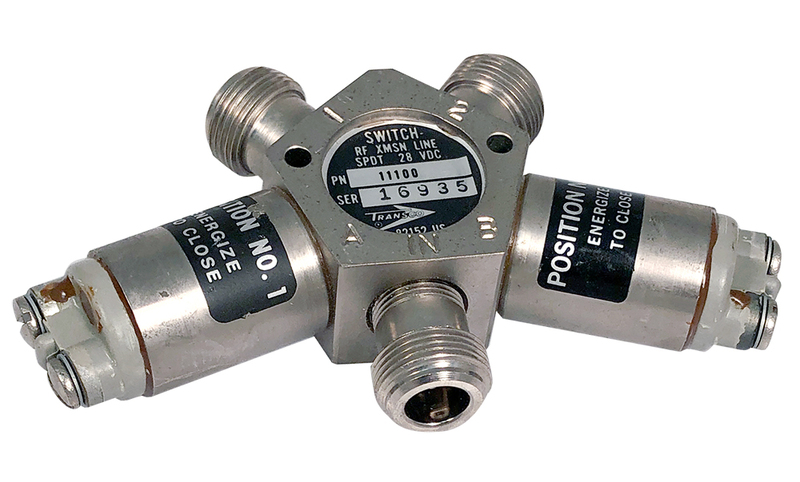 A superb Amphenol relay with an "HN" common port and "N" connectors for N.C. and N.O. ports. Handles 2500 watts. 1 GHz. Armature has double gold contact for reliability with "break before make" configuration. Grounds unused port. 26.5 vdc coil. New. 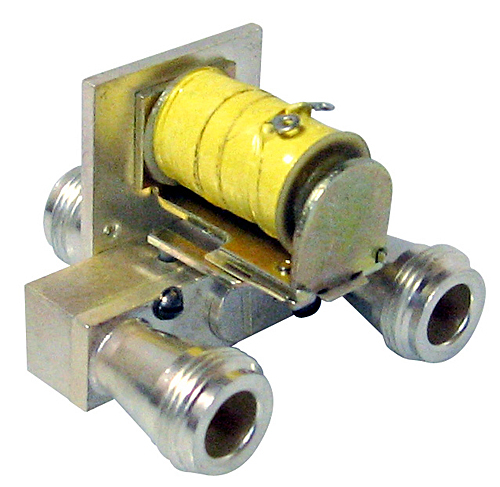 Magnecraft RF coaxial relay. 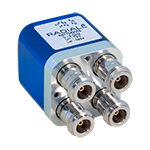 Our most popular economy RF relay. SPDT, type "N" connectors. Mil-spec. 500 watts to 30 MHz, 200 watts to 1 GHz. 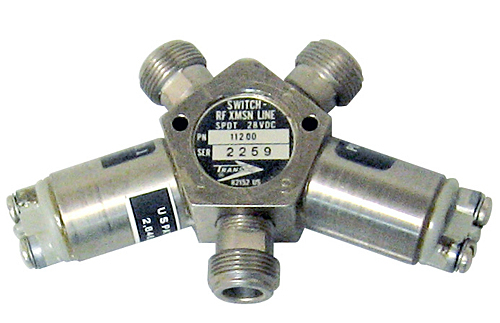 Amphenol RF transmission line switch, non-transfer. SPDT. 3 coupling. 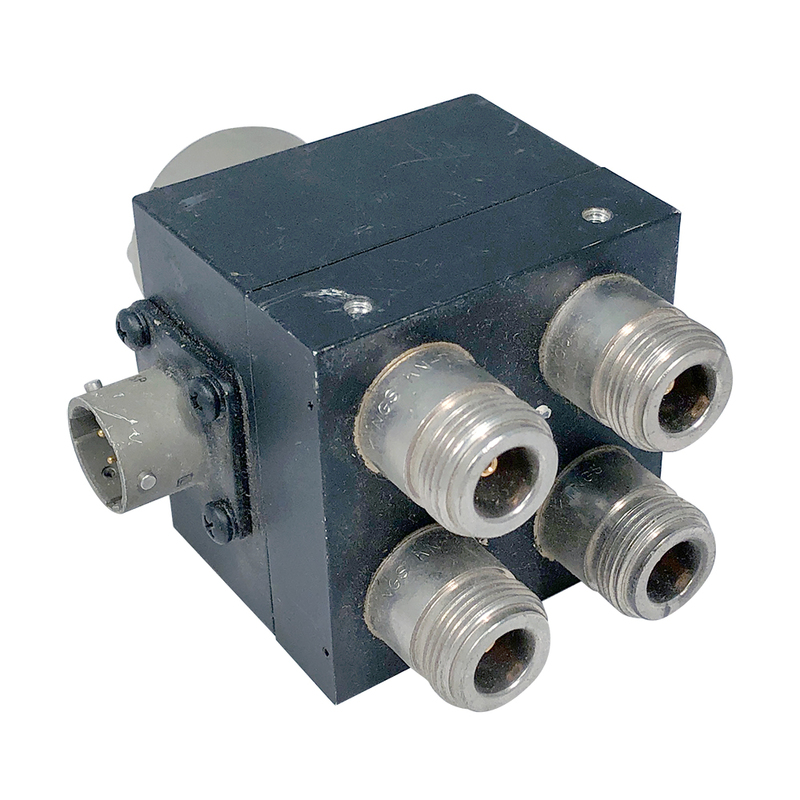 115v AC, 3 GHz max, "N" female connectors, 500w, 70 dB, 1 amp AC. Break before make, 15.0 millisecond switch time, fail-safe return mechanixm. Steel body. 2.625"L x 2"H x 2.5"W. NSN: 5985-00-557-6117. Circa 1965. Dowkey relay. 28 vdc coil, typical DK60 rating of 2 kw DC-30 mc. SPDT, "N" female on common and N.C. ports. N.O. port is bulkhead post for solder connection within a shielded body. NSN: 5945-958-2657. 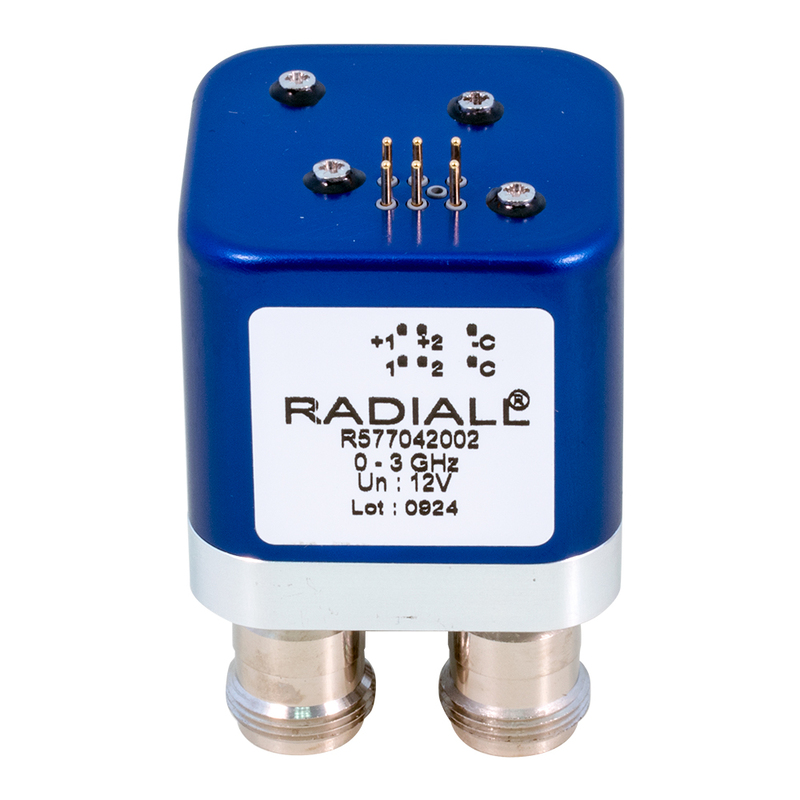 Radiall High Performance "N" (female) Latching Transfer Switch with Indicator contacts, DC - 3 GHz, 0.15 - 0.25 dB maximum loss (0.15 dB @ 0-1 GHz, 0.2 dB @ 1-2 GHz, 0.25 dB @ 2-3 GHz) with 75 - 85 dB isolation (75 dB @ 3 GHz, 80 dB @ 2 GHz), 400 - 700 Watt power (400W @ 3 GHz, 500 W @ 2 GHz, 700 W @ 0.01 GHz), 50 ohm impedance, 12 vdc @ 320 mA actuator, Solder pins, Indicator maximum 30 V @ 100 mA (1 Watt), Position 1: 1<->3, 2<->4 and Position 2: 1<->2, 3<->4. Alt. P/N: R577042002.